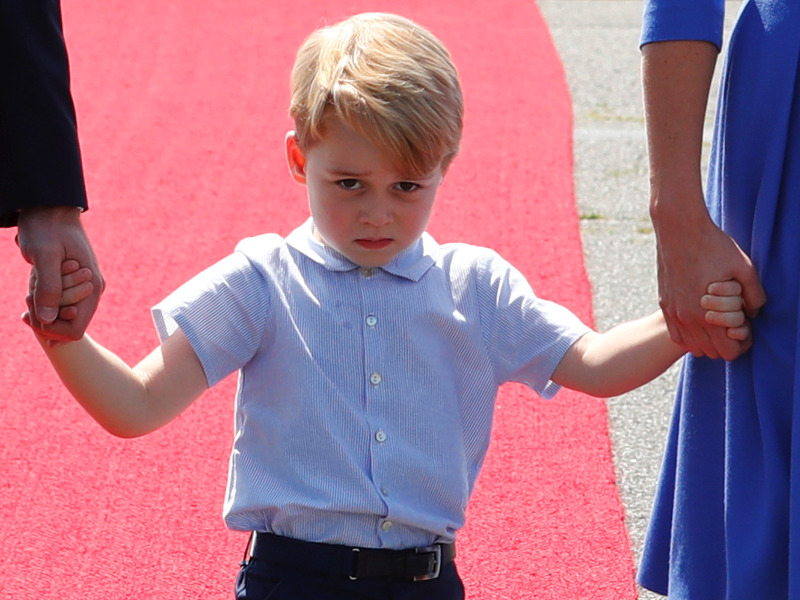 In honor of Prince George’s fifth birthday, I attempted to spend a day in his shoes. My day involved recreating one of his outfits, eating food from his school’s lunch menu, and doing some of his favorite activities. While most of it was fun, the day gave me a newfound respect for the attention placed on the royal family. Kate Middleton and Meghan Markle and their husbands are great and everything, but let’s be real, the best members of the royal family are Prince George and Princess Charlotte. They steal the show everywhere they go, and with good reason. Princess Charlotte already waves just as regally as the queen, and George is inherently interesting as the firstborn of Prince William and Middleton. 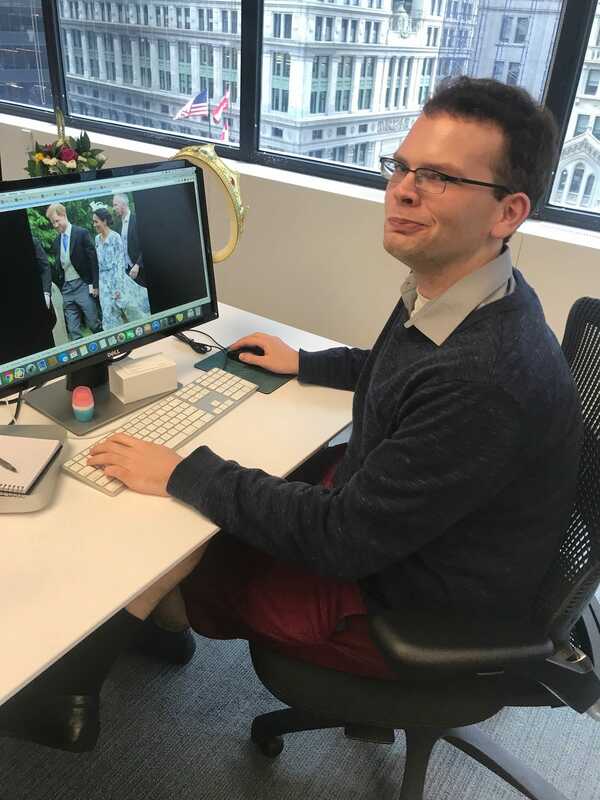 I often spend way too much imagining what the royal family’s day-to-day life is like, so I decided to try putting myself in one of their shoes for the sake of very serious and hard-hitting journalism. Seeing as George’s fifth birthday is upon us on July 22, it only felt natural to pay tribute by spending a day inspired by everyone’s favorite shorts-wearing little prince. I started my day by recreating one of his looks. 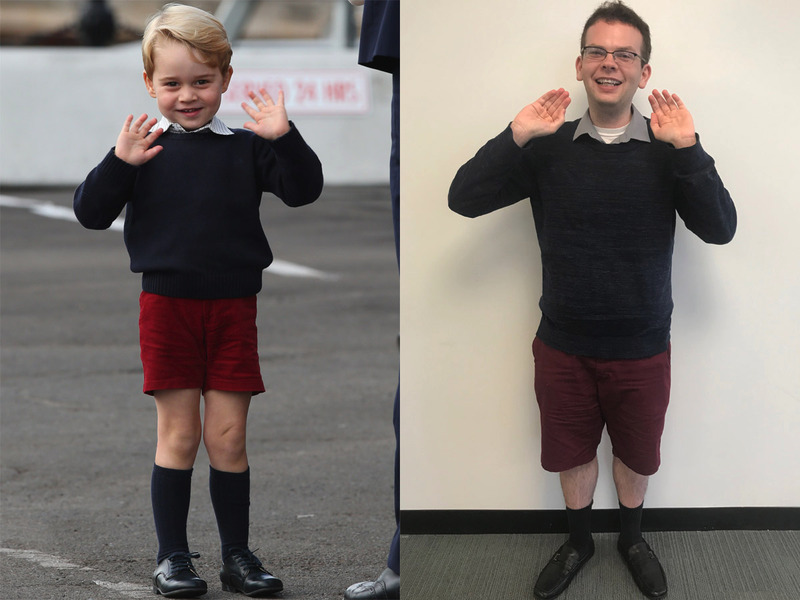 Prince George has been responsible for plenty of fashionable moments, but I went with this red shorts and blue sweater ensemble to pay homage to the moment he invented the iconic two-handed wave while on a royal tour of Canada. 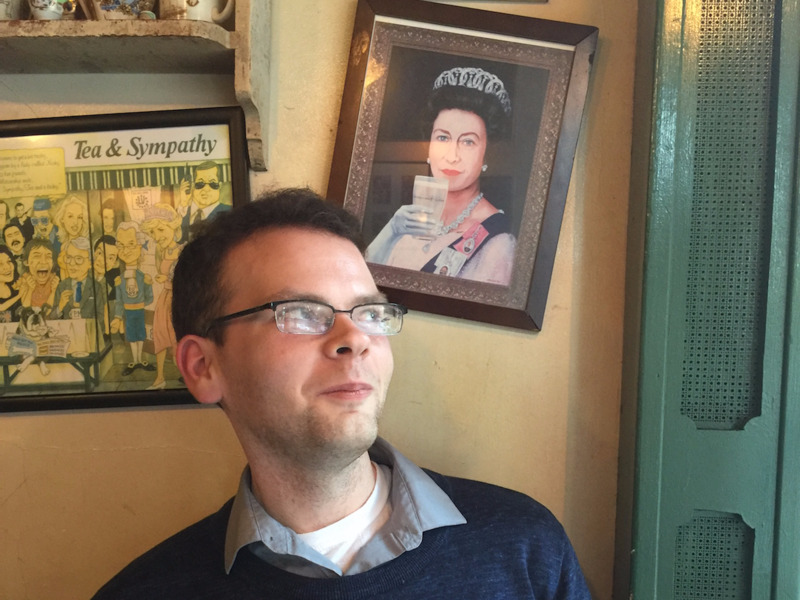 As I left my luxury flat in Buckingham Palace (see: shared tiny apartment in Brooklyn) and stepped into my royal carriage (see: crowded subway), I immediately felt self-conscious. 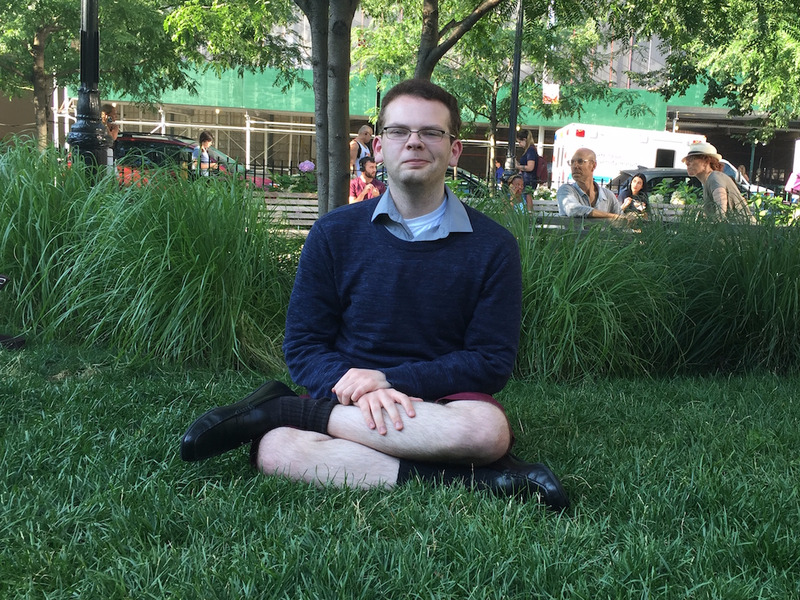 I got a few odd stares — either because I was dressed like a schoolboy or because I was wearing a sweater in the scorching NYC summer heat — and I buried my head in my phone to try to look very important and have a place to direct my awkwardness. Why did I decide to wear a sweater in the middle of summer, you ask? 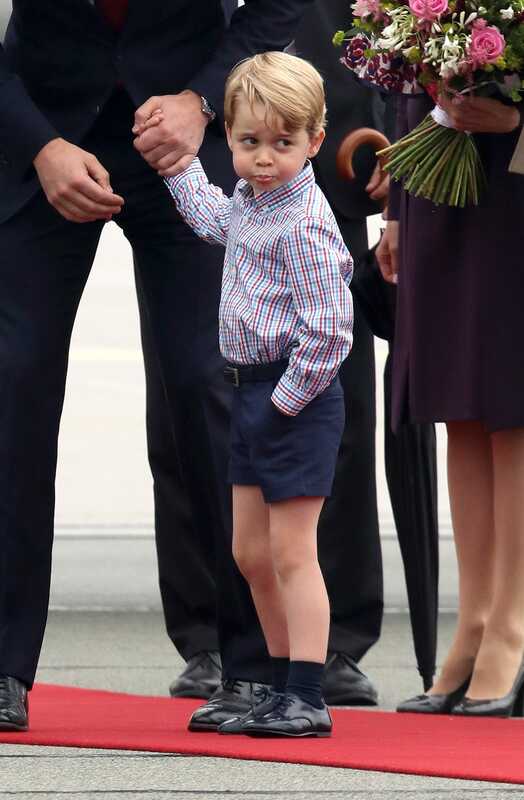 I noticed that royal tradition often has Prince George wearing shorts in the cold months of winter, so I figured I needed my outfit to be seasonally inappropriate to get the full experience. When I arrived to work drenched in sweat from the uncomfortable outfit, I was disappointed to find out that I still had to work. I guess this is fair, as I’m sure George still has to learn math and read books or whatever 4-year-olds do in school. Thankfully I was able to stay on-theme since my job entails something I imagine Prince George does often: evaluating his new aunt’s outfits. 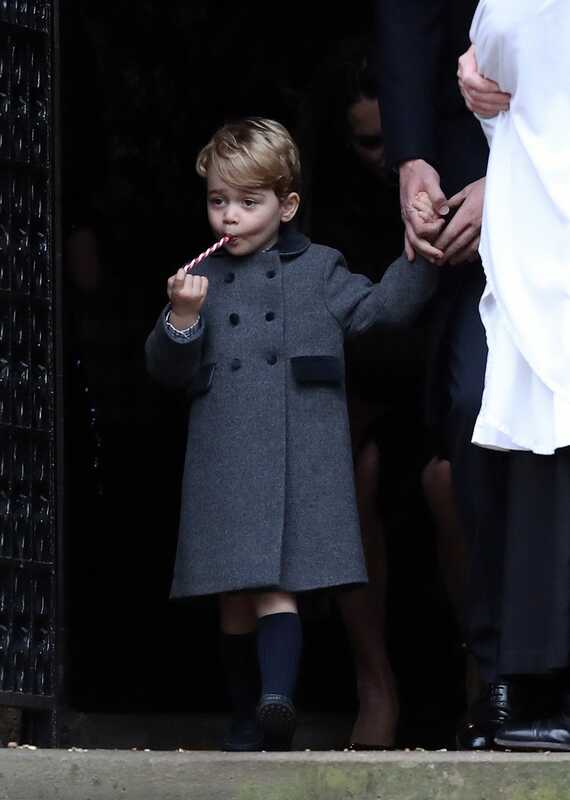 After writing up a story about Markle, it was time for my mid-morning snack at 10:30 a.m. George attends the illustrious Thomas’s Battersea Day School, and its sample catering menu includes fresh fruit and a glass of milk as a snack, so that’s exactly what I had. 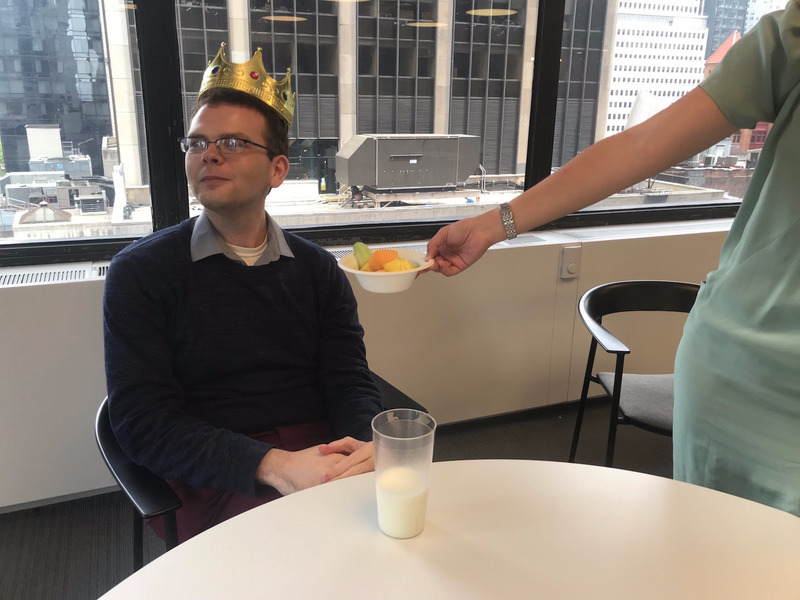 Since George would never dream of serving his own food, I made my co-worker Kat bring it to me — with very strict instructions not to let her commoner eyes make contact with my royal ones. Scheduled mid-morning snacks definitely need to become more of a thing for adults. It was a much-deserved mini-break from the whopping hour-and-a-half of work I had done, and snacks are always a good idea. This was a 10/10 addition to my day and I’ll be incorporating it from here on out. About two-and-a-half hours later I decided it was time to spend some time in the park, as George is often spotted doing. He seems to really enjoy it, but this was by far my least favorite part of the day so far. For a full half hour, I was surrounded by nature, sunshine, and children. It was a 0/10 addition to my day and I definitely will not be incorporating it going forward. Then it was time for a late royal lunch. People have been fascinated by George’s menu at his new school, as it is much different than the usual school cafeteria fare, including items such as Chicken Paella and Coq au Vin. 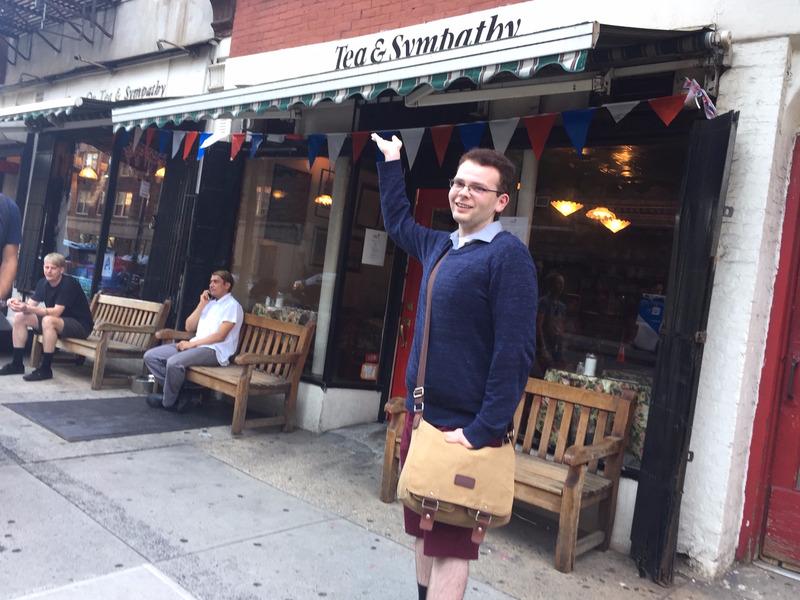 I took a trip to Tea & Sympathy in the West Village since they serve one of his most traditional lunch menu items: shepherd’s pie. I felt right at home as soon as I was seated, especially since my great-grandmother decided to join me. 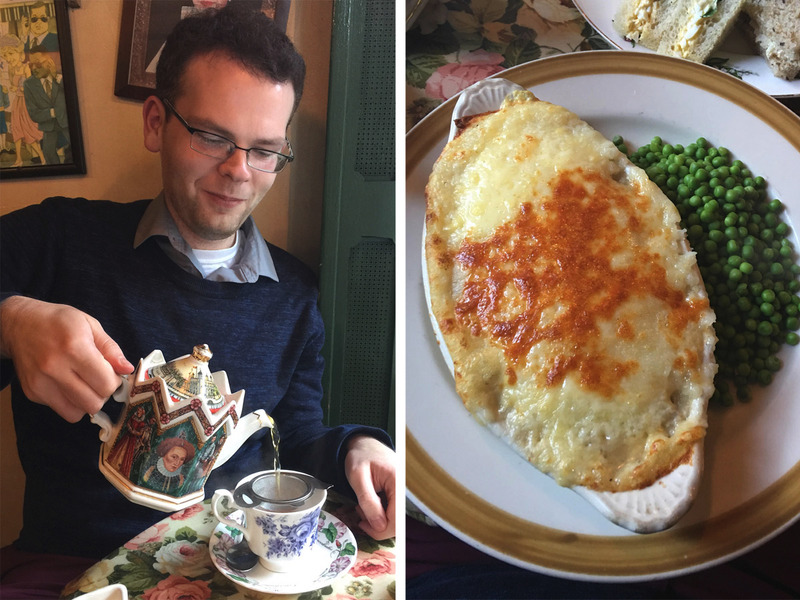 After a nice cuppa (see: tea in a fancy teacup that I wished was coffee instead), my shepherd’s pie arrived. It definitely was nothing like the greasy pizza and smiley-face potatoes I remember from my school cafeteria. It was so hearty, filling, and homemade tasting that I couldn’t imagine eating something like this in a school setting. I immediately wanted to take a nap. However, napping would have to wait, because I needed to eat dessert to get the full experience. 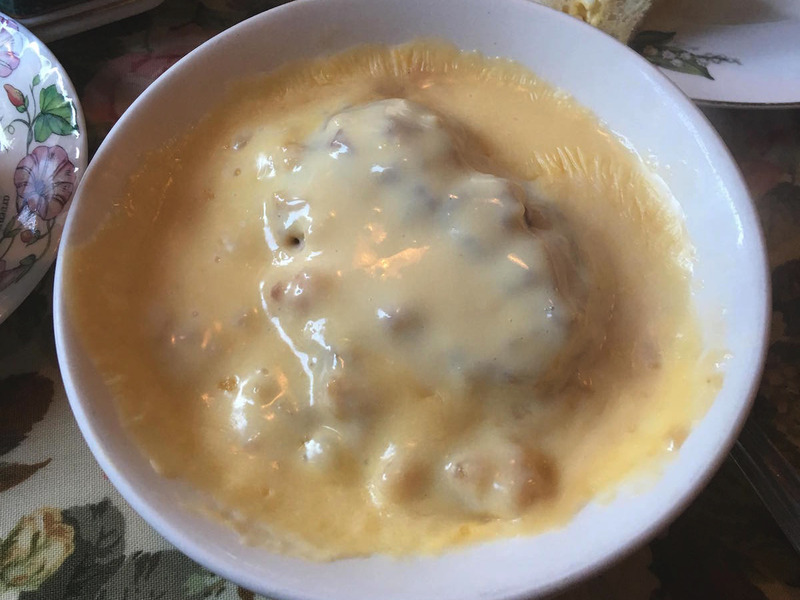 His school menu lists „apple and cherry strudel served with fresh cream“ as an option, but an apple crumble with custard was the closest Tea & Sympathy had. It was creamy yet crunchy and delicious, and much better than the freezer-burned ice cream sandwiches I remember from my elementary school days. While I’m sure George is served much smaller portions of these dishes, I ultimately did feel a pang of jealousy that his typical lunch is much better than mine will ever consistently be. After feeling like I had gained 10 pounds from such an extravagant lunch, I went back to the office. 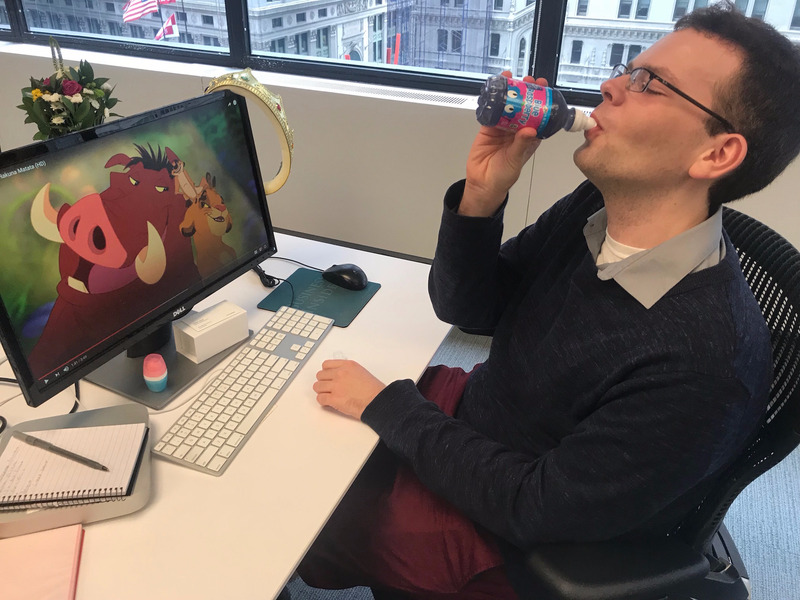 I was much too full of British treats to work, so I kicked back with some juice while enjoying one of George’s favorite movies: „The Lion King.“ I might also start incorporating this into my daily routine. 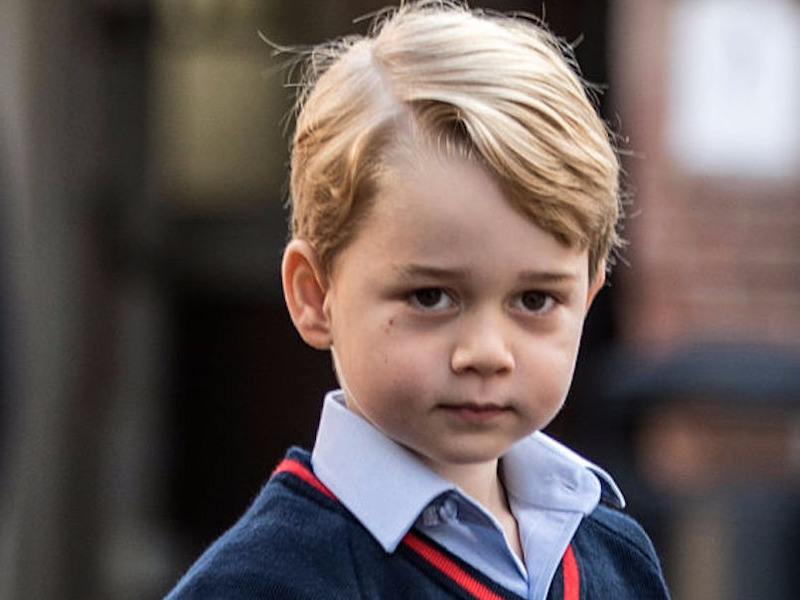 It then hit me that I would soon have to make my way back onto a crowded rush-hour subway in my Prince George getup, and it made me reflect on the amount of attention the young royal must face in his day-to-day life. Though the attention he commands has less to do with his outfit and more to do with his status, it must be incredibly difficult to deal with. The public — myself included — seem to feel like we know him, but we forget he is a child. If I, a fairly secure grown man, feel self-conscious at the thought of a little extra public attention from commuters on the subway, imagine how a 4-year-old might feel with the whole world watching. As delicious as my snacks and fancy lunch were, my day did feel weirdly thrown for a loop. It seems silly since the additions to my day were rather frivolous, but I felt out of place in my outfit and my whole schedule was a bit out of whack. I then started to wonder if Meghan Markle is experiencing a super heightened version of this inconvenience. 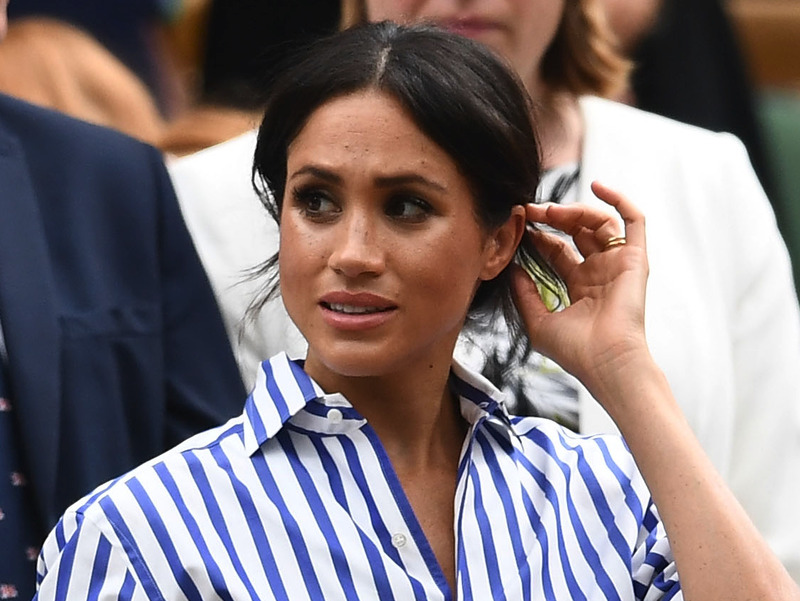 While George was born into the public spotlight, Markle has had to adapt to a completely new way of life at 36 years old. Though there are certainly worse things than adapting to royal protocol, perhaps Markle’s father was onto something when he mused that his daughter is „terrified“ of her newfound attention. Her experience may not be as dramatic as he described it, but it’s not tough to imagine feeling the pressure that comes with her new highly scrutinized role. So as my driver arrived (see: subway conductor) and I made my way home with my face buried in my phone once again, I came to the conclusion that Prince George and the rest of the royals may not have it as easy as it seems. I’ll keep the mid-morning snack, but I’m more than happy to leave the uncomfortable clothes and constant attention to the royal family.